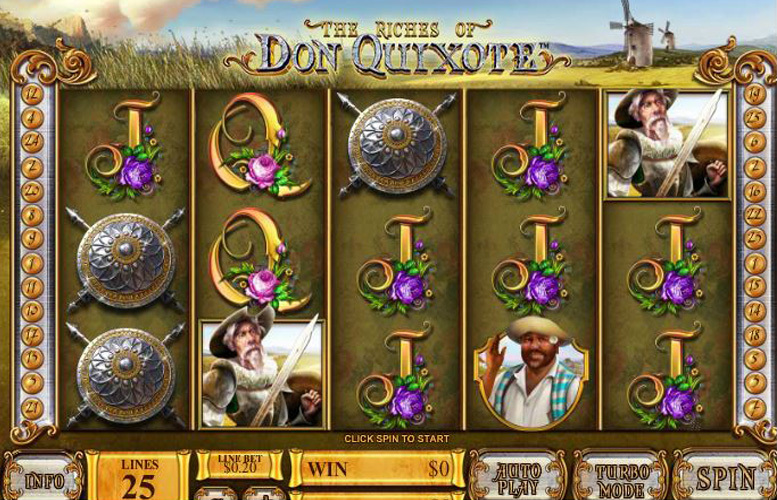 The Riches of Don Quixote by Playtech is a great title which draws inspiration from the classic Spanish novel entitled The Ingenious Nobleman Mister Quixote of La Mancha. The game utilises tasteful artwork, 25 win lines, and some potentially lucrative side features which really make it a title worth playing. Unfortunately, there isn’t a great deal for the well-seasoned player within The Riches of Don Quixote. The bonus features are like many other titles, and it brings little new to the table. High volume players will almost certainly struggle to find enjoyment on multiple visits. Fantastic art style. The background, and symbols Have been carefully designed This works well with the music Which provides a suitable atmosphere for the title. Several lucrative bonuses. Free spins with increasing multipliers and stacked symbols during the game provide players plenty of opportunity for huge winnings. The main game jackpot is somewhat low. Similar video slots offer impressive five-figure prizes. The Riches of Don Quixote’s top pay-out is considerably less. The lack of variables with regards betting might put some players off. The only value that can be adjusted is the amount bet per win line, limiting bet distribution somewhat. Windmill “wild” = 3,000x the line bet. Don Quixote = 600x the line bet. Senorita = 400x the line bet. Helmet = 200x the line bet. Shield = 150x the line bet. As noted, the game features on The Riches of Don Quixote are potentially lucrative, although rather samey when compared with other video slot machines. There’s no real innovation going on, and this hurts the game’s ability to engage repeat users. 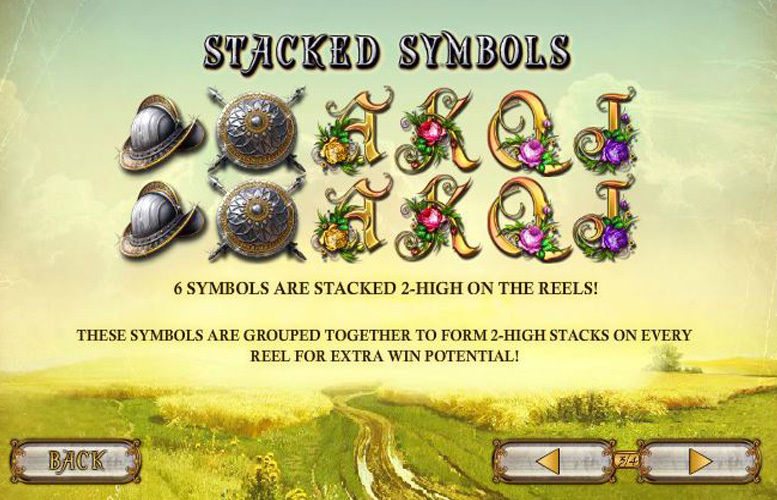 Landing three or more golden novel “scatter” symbols will award players with ten free games. These bonus spins have a 2x multiplier as default, which increases by +1 every two spins. 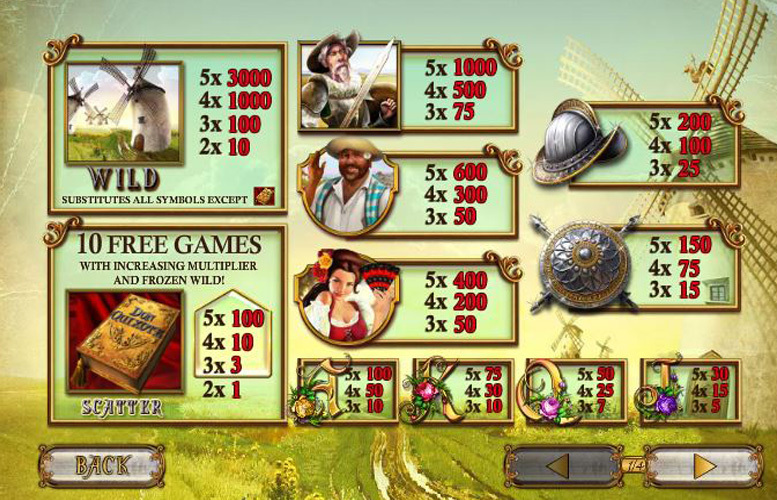 In addition, there are additional “wild” windmill symbols that remain locked in the middle position of reel three for the duration of the free games. This can of course substitute for all symbols except “scatter”. Players should note that landing additional “scatter” symbols will not retrigger extra free games. All symbols on the reels appeal in stacks of two high. This can dramatically increase the winning potential winnings of every spin. King = 75x the line bet. Jack = 30x the line bet. 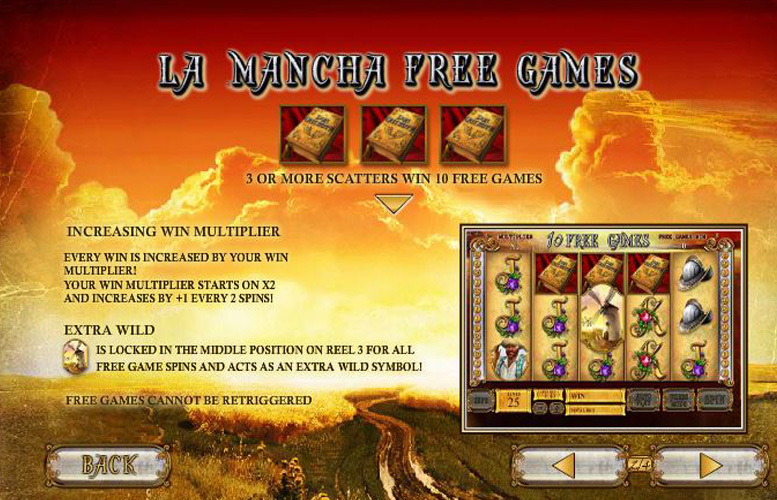 Players are only able to vary the amount bet per win line on The Riches of Don Quixote. The number of win lines are fixed at 25. The maximum bet per win line is £100. This makes the highest total bet an impressive £2,500. 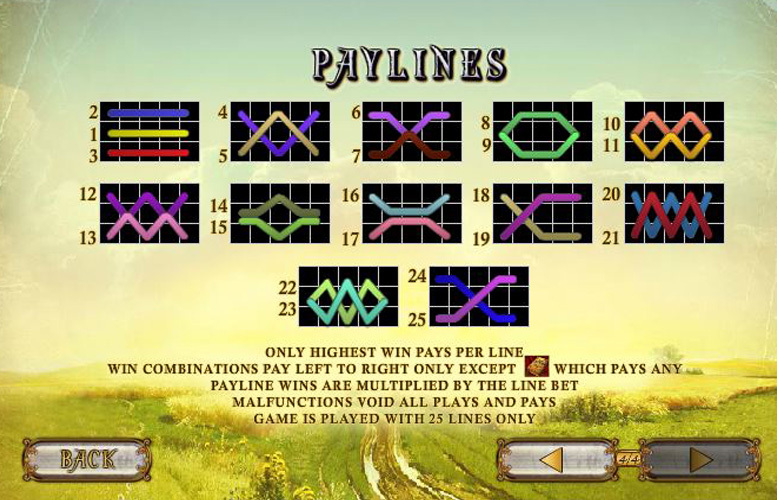 The minimum possible line bet is just one penny. Therefore, the smallest total bet that players can wager per spin on The Riches of Don Quixote is just 25p. This slot is a solid entry. It doesn’t exactly “wow” us but it does very little wrong too. If you’re a casual online casino user, particularly one who’s a fan of classic literature, you’ll likely find it more than exciting enough for a quick spin. However, those who use slots more frequently might find the basic features, and uninspiring top jackpot less than stimulating. Stacked “wilds” and increasing free spin multipliers might be potentially very lucrative bonus rounds but they lack the innovative of some modern slot machines. This game has a rating of 3 / 5 with 282 total reviews by the users.